A&P Andreou Brothers – Commercial specializes in a wide range of products for the professionals and the DIY enthusiasts. Exclusive distributor of top international brands for electrical tools, machinery and paints by utilizing its extensive network of specialized sales partners in Cyprus. With over 40000 different products, our goal is to provide professionals and discerning individuals with a high quality of service. 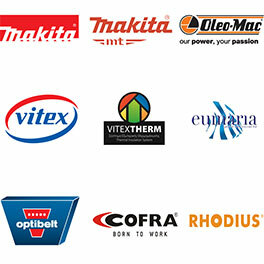 Our portfolio of leading brands. The company’s products includes renowned innovative brands in electric tools, paints, insulation materials, garden tools, and also in light industrial products, from machinery belts to welding devices, with a large range in parts. For more information on A&P Andreou Brothers – Commercial, please visit the Division’s website.